…that has a very nice graphic and explains it very well. I will try to explain it as well here. A door below the nose of the aircraft. The waist door near the rear of the aircraft on the right side. An emergency exit door in the tail of the aircraft. Navigator and Bombardier from the door below the nose. Pilot, Co-Pilot, Top Turret Gunner/Enginner, and Radioman from the bomb bay doors. Ball Turret Gunner and Waist Gunners from the waist door. Tail Gunner from the tail gunner’s emergency exit. The pilot called for everyone to put on their parachutes and bail out over the interphone and using bell signals. The tail gunner, waist gunners, and ball turret gunner bailed out. The ball turret gunner first had to exit the ball turret and hook up his chute as he did not have room in the ball turret to wear it. 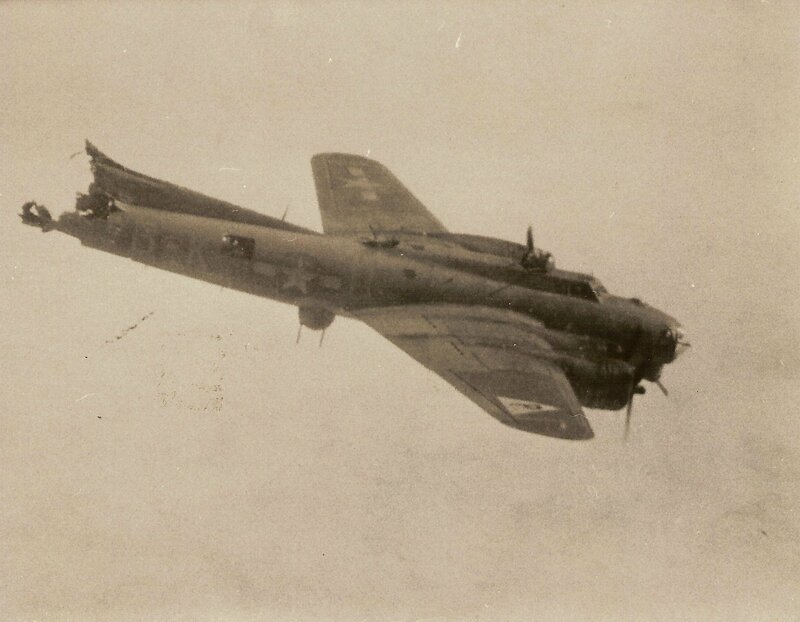 The pilot used the emergency release handle to clear the bomb bay. The pilot turned on the autopilot, reduced air speed, held the ship as level as possible, and monitored the crew’s evacuation of the aircraft. The co-pilot assisted the pilot. If the pilot was incapacitated, the co-pilot would take over the pilot’s duties. The navigator figured out the aircraft’s position and relayed the information to the radio operator (if time permitted). The bombardier assisted the navigator. The navigator and bombardier bailed out. The top turret gunner/engineer assisted the pilot if necessary. 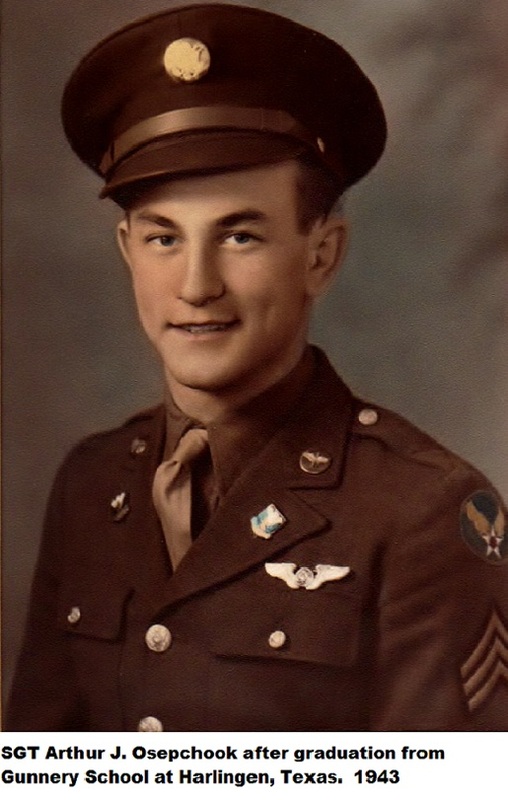 He notified the pilot once the navigator and bombardier bailed out. The top turret gunner/engineer bailed out. The radio operator sent a distress call and relayed the aircraft’s position (if time permitted). The radio operator bailed out. The co-pilot bailed out once the other crew members (other than the pilot) bailed out. The pilot bailed out once all the other crew members bailed out. Critically injured men were not able to bail out, although at times, they were assisted out of the plane by other crew members with their rip cords pulled, hoping the critically injured man would receive medical attention once he reached the ground. Parachutes were damaged or not hooked up properly. The centrifugal force of an aircraft in an uncontrolled spin would pin a crewman in place without a chance to make it to an exit. An aircraft might have blown up before the crew could exit. Some may have been blown out and parachuted safely to the ground. Once a man had bailed out, he had to free fall for quite a distance before he could pull the cord and float safely to the ground. If he pulled the rip cord too soon, it would slow down his descent and he might die of anoxia (oxygen deprivation). Arthur “Ozzie” Osepchook of the 384th Bomb Group made quite a memorable exit from the Silver Dollar on March 9, 1944. Ozzie was the Silver Dollar’s ball turret gunner. During “bombs away”, the high group inadvertently dropped its bombs on Silver Dollar, knocking the tail completely off in front of the stabilizer. The aircraft dived straight down into a spin with all four engines going. Amazingly, Ozzie was able to get out of the ball turret and get his ‘chute hooked up, then was propelled toward the hole where the tail had once been. Unfortunately, Ozzie’s boots got stuck on mangled pieces of the aircraft and he couldn’t get free. Thinking quickly, Ozzie pulled the rip cord of his parachute, the chute opened, and pulled him right out of his boots and through the hole in the tail section of the ship. He landed safely – minus his boots – and suffered only a minor cut on one leg. 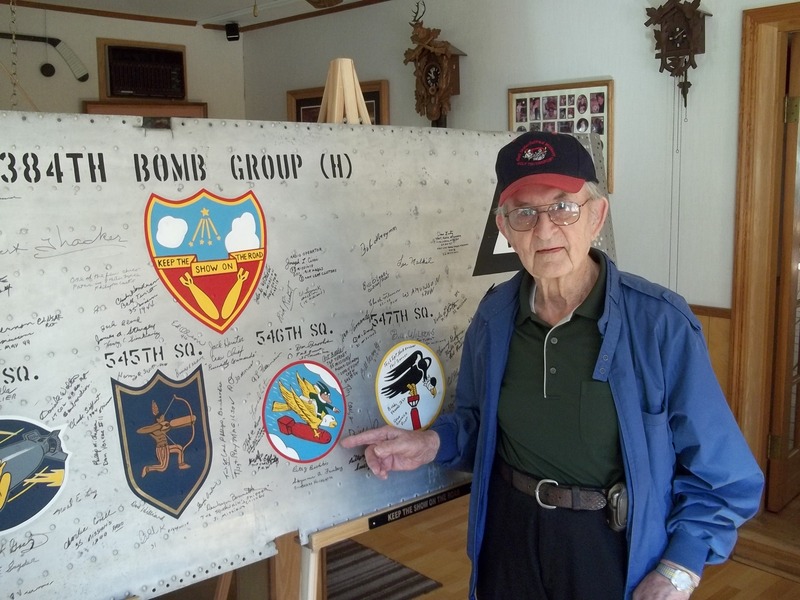 By thearrowheadclub in 384th Bomb Group, 384th Bomb Group Wing Panel Signing Project on July 8, 2015 .